Silverrod is the only white goldenrod in the eastern U.S. The glories of goldenrod are easy to see in August and September, and a few late lingerers last into October, but have you ever noticed the white goldenrod known as silverrod in Westborough or surrounding towns? 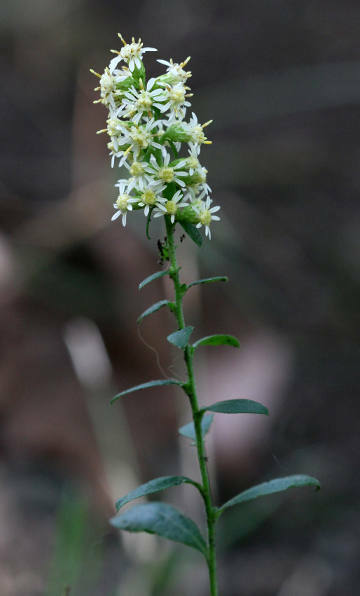 Silverrod (Solidago bicolor) is the only white goldenrod in the eastern U.S. Typically, its rod-like wand is sparsely decorated with small flowers along the plant’s stem. Sometimes the flowers are more abundant, giving it a bushier look (as in our photo). Especially when the flowers are plentiful, it might remind you of another late-season goldenrod called downy goldenrod (Solidago puberula) – except, of course, that silverrod is white. Both silverrod and downy goldenrod grow in dry or sandy places in late summer and early fall. In Westborough, one spot to look for silverrod is on the lake side of the trail along the northern shore of Lake Chauncy. (You can enter the trail at the gate at the far west end of the soccer fields on the state hospital land, off Lyman Street). Silverrod also grows at Purgatory Chasm State Reservation in Sutton, MA. Downy goldenrod is more widespread in our area, and you can find it along trails and in open woods. The little flowers of both silverrod and downy goldenrod are daisy-like, as are so many other flowers. Such flowers themselves are actually flower heads, made of many small flowers. Each “petal” is actually a flower (called a ray flower). The center or disc is also made up of lots of tiny tube-like flowers (called disc flowers). These daisy-like flower heads make it easy and efficient for bees, butterflies, and other pollinators to gather nectar: they can land in one place and take nectar from a large number of flowers, pollinating the flowers in the process. Downy goldenrod is one of the goldenrods commonly seen in the fall. Goldenrods are an important nectar source for bees, butterflies, and other insects in late summer, when fewer plants are in bloom. Picture these busy insects in your mind if you’re ever tempted to blame goldenrod for your summer and fall sneezes. Goldenrod pollen doesn’t readily become airborne. Instead, goldenrod pollen is relatively large, heavy, and sticky, so it has to be transported from flower to flower by bees, butterflies, and other creatures. The real culprit in summer sneezing is typically common ragweed (Ambrosia artemisiifolia), a weedy plant that bears tiny, inconspicuous green flowers that are wind-pollinated. Ragweed produces vast quantities of tiny, light pollen that readily becomes airborne and rides the summer breezes. How can you tell silverrod from the various white asters that also bloom in late summer and early fall? Think of the saying often chanted in childhood, “How do I love you? Let me count the ways . . . ,” as kids and grandparents pull the petals, or rays, off a daisy-like flower. Counting the petals, or rays, can be helpful. Silverrod flower heads usually have 7-9 white rays, surrounding a pale yellow center. Almost all asters (Aster species) have more than 9 rays. Fleabanes (Erigeron species) have more than 40 rays and often 50-100 or more rays in their daisy-like flower heads. Downy goldenrod usually has about 10 bright yellow rays. Goldenrods are native to North America, with about 50 species east of the Mississippi. Different kinds are adapted to thrive in all sorts of conditions. For example, here in New England we can find seaside goldenrod (Solidago sempervirens) near the ocean and salt marshes. Recognize it by its goldenrod flowers and thick, fleshy leaves that store water. Near the top of New England’s highest peak, Mt. Washington in New Hampshire, alpine goldenrod (Solidago cutleri) survives at altitudes around 5,000 feet (about a mile high), growing only 3-12 inches high in the harsh environment there. Like many native plants, from our milkweeds to native oaks and maples, goldenrods are used by many types of insects. More than 100 kinds of insects feed on the more common goldenrods, such as Canada or common goldenrod (Solidago canadensis) or tall goldenrod (Solidago altissima). Besides bees and butterflies of various kinds, you can find ants, wasps, spiders, moths, beetles, bugs, and many more creatures on goldenrod. They go about their business there – feeding, hiding, hunting, and reproducing. 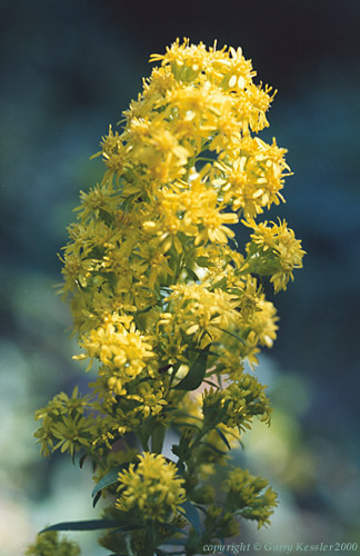 Native Americans had medicinal uses for goldenrods, as they did for many native plants. They used the root in treating burns and tea made from the flowers for fevers. They chewed the flowers for sore throats and used leaf extracts for urinary tract problems. Yellow goldenrod flowers can also be boiled to make a yellow dye. By this time of year, some kinds of goldenrod have finishing blooming and have already gone to seed. Their clustered blossoms turn into fluffy brown-gray plumes, wands, clubs, or flat-topped arrays of tiny seeds attached to fuzzy tufts that eventually fly on the wind. One stem may produce 10,000 seeds. Goldenrods also reproduce in another way. In late fall, after the goldenrod plants have produced seeds and appear dead to us, 2-6 underground stems (rhizomes) keep growing, extending away from the plant. Then they go dormant for the winter. In the spring, the tip of each underground stem sprouts new leaves and a new above-ground stem. These stems flower in the summer or fall. Plants produced from underground stems are genetically identical to the plant that grew the underground stems. Now in October, our attention turns to the first fiery foliage of autumn – the brilliant reds of red maple, sugar maple (with orange and yellow as well), sumacs, dogwoods, Virginia creeper, poison ivy, the widely planted but invasive burning bush (Euonymus atropurpureus), and the rusty reds of little bluestem grass. But let’s also appreciate our unique silverrod and the many native goldenrods that we’ve enjoyed, and remember that their seeds and underground stems are ensuring that their glories will return again.